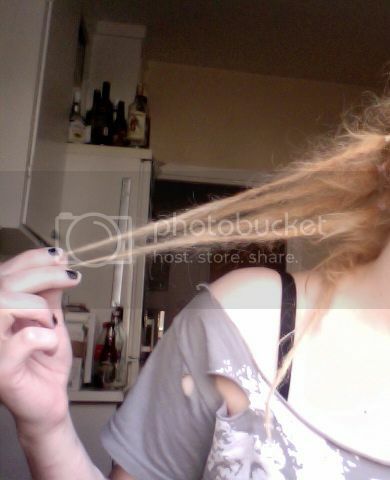 I've decided to get real dreads. I recently took out my synth dreads and have started dreading my hair (only 7 so far!). I'm using a combination of the backcombing and the twist 'n' rip method (with palmrolling). I'm not using any products at all. I secure the roots with rubber bands to keep them separated because my hair is so damaged that hair around the roots can be around 3 inches long and I can't get it to dread up properly yet, so I just want to make sure that they won't merge together in the beginning, but I will be removing the rubber bands in a couple days, or once I finish dreading all my hair (I'm leaving out my fringe). 1) How long do you have to wait before washing baby dreads? 2) How often can you wash baby dreads and for how long until you can do it every 2-3 days? 3) Are there any household products or anything I can easily buy to wash them with until I'm able to acquire proper dread shampoo? E.g. is clarifying shampoo ok, or will it also leave residue? 4) How soon can you dye baby dreads? I bleached my hair before starting to dread it, and was too impatient to wait to dye it again before starting to dread it! I want to get it to a more natural looking blonde, so I'm really quite concerned about this question! 5) What's the best method to attach synth dreads (not permanently) to the real dreads? I've heard about passing the SE loop through the root of the dread, then passing the SE through its own loop. Does that sit well on the head, or will a rubber band be necessary? 6) If the roots aren't backcombed enough (I simply cannot get them tightened enough on my own, have no one at all to help me and cannot afford professional help), is it a major problem, or can I fix the problem later on during maintenance? 7) Is it ok to attach synth dreads to baby dreads, or is it absolutely imperative that I wait until my dreads mature before attaching synths to some of them? 8) I'm paranoid about moisture remaining in the dreads too long after showering, especially since my hair is so damaged that its porosity retains more moisture than hair in better shape. I'm assuming it's ok to dry them since it's human hair, but will that make a difference during the baby dread stage? Thanks so much, and sorry for all the text! Cheers. P.S. : Here's What my dreads look like so far (maybe you can see the root backcombing problem I mentioned earlier, with the shorter bits popping out). Any criticisms or pointers? Thanks! Hellooo! Sorry to be bothering, but I'm about to go buy some box dye today, and I'd like a quick answer to question #4; I'm getting a bit paranoid! I have about 10 more dreads to make and I'm done. So I'd say the first ones are a few days old and the rest are from the day before, yesterday and today. Would it be incredibly stupid to dye them, or is there a chance that they will still hold together? Keep in mind that my hair is VERY damaged and knots easily. My hair is a very brassy yellow and I'd like to get rid of that color asap. Sorry for pestering, just anxious! Thanks again! Perhaps in hindsight you hound have sorted the colour before dreading so the dye penetrated all of the hair. I would say dye whenever you want really but it may be patchy and need doing more than once. Make sure they are as oil free as possible first. You're right, but my hair is in such bad shape that I decided to just go ahead and dread it.